My dog likes to stick his nose up people’s behinds and my cat is prone to unprovoked biting and running out any open door like a psycho flash of lightning. My pets are great, but they have some eccentricities and not everyone loves them like I do, so I am sure to put them up when I have visitors. Maintaining your home with pets is a lot of work, no bones about it. Pets are not everyone’s cup of tea—some folks have allergies or are just not into them at all. That is their prerogative. However, what you do want them to be into is your house (whether you are selling or just having company over!) 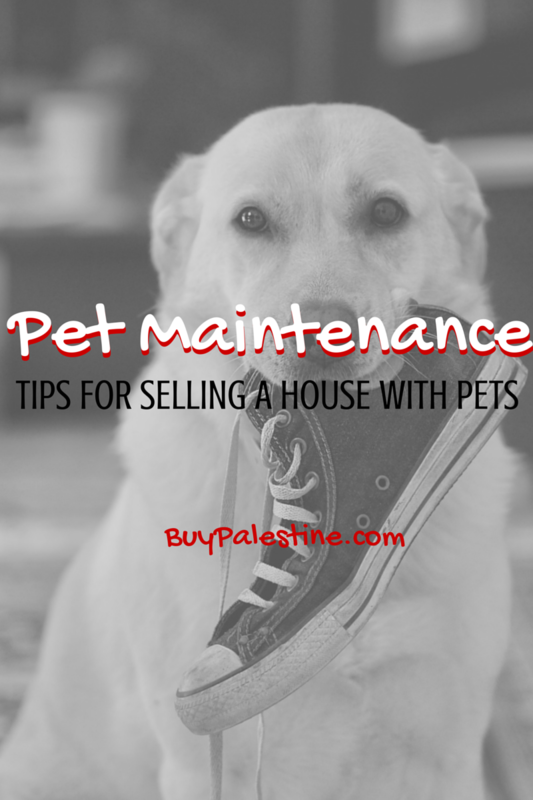 So, make it easier for yourself (long-term, anyway) and do some preventative “pet maintenance” before each showing so you can sell your home quickly and for top dollar! This may be the hardest pill to swallow. If the house smells like a litter box or like wet dogs, its not going to do you any favors at showings. Sometimes, we don’t know that our home has pet odors. I suggest that you directly ask your real estate agent—“Does my house stink?” Your REALTOR has the same end goal as you do—to sell fast and for top dollar. It is an uncomfortable situation; but believe me, all agents have seen worse, so don’t be embarrassed. If you are not comfortable asking your agent, ask a close friend or family member—tell them to be honest and don’t hold it against them! Your first job is to identify any odors and where they are coming from and get a game plan to combat the odors/problems. Real Life example: I once was involved in a transaction where the home was very nice, spacious and had several upgrades as compared to others in the neighborhood—except it had blue cat pee soaked carpets throughout the ENTIRE house. Most buyers/agents left as soon as the front door was opened and never even made it past the entryway, so we got a $30,000 price reduction. YES, you read that right…thirty thousand dollar cat pee! This was an exceptionally bad odor problem, but learn from it–don’t be that house. Start targeting your problem areas. Invest in a good deodorizer—not a smell masker. Hire professional carpet cleaners (ask about pet enzyme treatments if needed) and clean up all pet areas thoroughly and on a daily basis. Showings can happen at any time—don’t be caught off guard. If your pets roam free while you are out of the house, then it may be wise to ask for 1-2 hour showing notice. Discuss the pros & cons of requesting notice from your real estate agent. Hide Pet Paraphernalia – If possible, remove litter boxes, bowls, cages, etc. before a showing. This is not always possible, so if you can’t remove it, try to keep it as inconspicuous as possible (i.e. : no litter boxes by the front door). Don’t forget to pick up pet waste from the yard daily—don’t let a last minute “Hello!” from your pet end up on a potential buyer’s shoe and kill the sale (or even worse if it is tracked throughout your house during the showing)! Take the pet out—If at all possible, take the pet(s) out of the home during the showing. Just like you shouldn’t be present at the home during a showing, neither should your pet, if possible–go for a walk, go to the pet store, go to the dog park…just GO! Kennel – if you cannot (for whatever reason) remove your pet during showings, make every effort to temporarily put your pet in a kennel or crate—especially if your pet is an escape artist. It’s a bad situation when a pet gets loose from the house and the agent can’t get the pet back inside.